A significant proportion of the world’s timber is harvested, transported, processed and traded in violation of the national and international laws. This has serious environmental, social and economic consequences. Poor governance of forest resources combines with weak rule of law to undermine sustainable economic growth, societal equity, and environmental conservation. The effects of unsustainable forest management and illegal forest activities include: significant loss of revenue to governments, the private sector and rural communities (especially forest-dependent communities); degradation of the environment and forest ecosystems; loss of biodiversity; and the loss of carbon stocks, further exacerbating climate change. The World Bank estimates the global annual market losses from illegal cutting of forests at more than 10 billion USD - more than eight times the total of Official Developmental Assistance (ODA) for sustainable forest management. Illegal exploitation of forest resources (often driven by organized crime), affects various sectors of society. The underlying causes of illegal logging are complex and often extend beyond the forest sector. Drivers frequently cited include: rural poverty and subsistence-level living; demand for fuel for heating and cooking; lack of stakeholder participation in management and low levels of public awareness; corruption and a general failure of governance and; unclear, controversial or simply nonexistent policies and legislation; poor implementation of existing laws; unclear or unfair ownership or tenure of forest resources; weak institutional structures; and inability to monitor and enforce the regulations applicable to the use and conservation of forest resources. All these issues are difficult to address and require time and investment to bring about significant and lasting change. 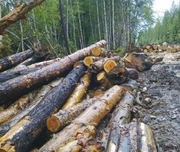 Activities that undermine long-term management and economic development can include illegal logging, timber theft and smuggling, trade of illegal wood, unauthorized forest conversion, unclear legislation, unclear tenure arrangements and lack of enforcement of forest regulations due to corruption. The Forest Law Enforcement and Governance (FLEG) Program was created to combat the threats posed to forests by illegal logging, trade, poaching and corruption. The initiative is comprised of processes which address the complex and politically-sensitive issues related to illegal logging at national and regional levels, and is implemented in cooperation with the major stakeholders from governments, civil society and the private sector. The FLEG Program has the potential to make an important contribution to the struggle against illegal logging and illegal timber trade, by targeting both the producer countries and consumer countries, and ensuring governments strengthen regulations and rules of law to prosecute individuals and companies involved in the illegal timber trade. It promotes increased regional and international cooperation, as well as greater law enforcement, governance and transparency. However, even well designed initiatives will fall short unless there is political commitment and cooperation at the highest levels. Improving forest law enforcement and governance will require collaboration across sectors and stronger stakeholder involvement. For more information click on the links listed in Sources. For more information on forest governance and deforestation policies in the European Union click here.